Added sugars are sugars and syrups added to foods during processing or preparation and sugars and syrups added at the table. 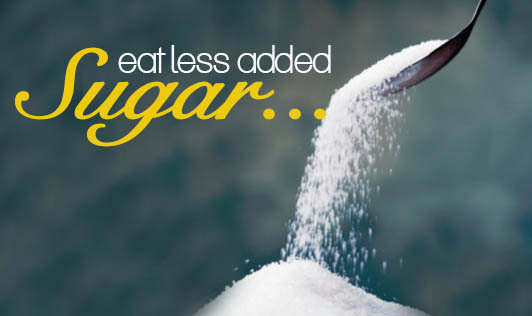 The sources of added sugar include soft drinks, other sugar sweetened beverages, candy, cakes, cookies, pies. Eating a lot of added sugars, as opposed to naturally occurring sugars (such as you would find in fruits), has contributed to the rise in obesity. It's also associated with increased risks for high blood pressure, high triglyceride levels, other risk factors for heart disease and stroke. Consuming foods and beverages with excessive amounts of added sugars takes the place of more nutritious foods and beverages for many people. To ensure that you're eating the proper amount of nutrients and limiting calories, be sure foods with a lot of added sugar are not taking the place of nutritious foods in your diet. • Eat a fruit to satisfy your sugar craving. • Reserve high calorie desserts for special occasions, and eat them in moderate amounts. • Choose desserts that are better for you - such as yoghurt topped with fruits and nuts. • Buy whole-grain, unsweetened cereals for breakfast. If you want a sweeter taste, add a fruit or raisins.